Before retiring in 2005 Buz instructed kids in the laurels of the outdoors for twenty nine of the thirty-eight years he was a teacher, as part of either an Outdoors Class or a Natural Resources Class affiliated with the science department at Boyne City High School. Hundreds of students have learned a multitude of information from the hands on approach this man took to the wonders of Mother Nature and the sanctity of how humans need to work with her. From constructing turkey barrels to hiking through swamps in winter, to identifying those species of trees that inhabit the NW section of Michigan, Buz led his charges with excitement, sensitivity and dedication in his role as an educator and steward of the land. After three plus decades of teaching and even after his retirement the enthusiasm for the field he enjoyed remains. He revels in the fact that, “I could be outside everyday instead of reading out of a book, yet still reaching the goals set forth by the State and the local district. I also enjoyed working with the various conservation groups on projects and other areas of concern and still do.” Some of those areas included working with “Friends of the Boyne River” organization by erecting signs, mulching trail ways, and doing a yearly water quality analysis of organisms in conjunction with the DNR. In addition, his students built over 90 turkey feeders over the years for the Traverse Bay Chapter of the Michigan Wild Turkey Hunters Association, plus put on a program at a meeting for Friends of the Boyne. “The students were great with the program. They learned a lot, as did I,” Buz declared. 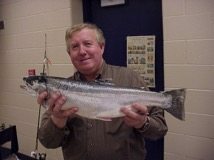 In the 2004-2005 school year, the Charlevoix Community Foundation (CCF) approached Lockman about the possibility of implementing a “Salmon in the Classroom” program with the goal of studying and observing the life cycle of the Chinook salmon. The CCF supplied a $2000 grant to offset the cost of 400 Chinook salmon eggs and the equipment needed for their care. In October of 2004, the Conservation Resource Alliance (CRA), based out of Traverse City, Michigan delivered the equipment to Lockman’s classroom. The students were then introduced, by individuals of the CRA, to the proper care of the fish who remained in the egg state until late November when the students noticed that many of them had hatched and in no time grew into the fry stage, the third of six stages that salmon go through. With the supplied ‘chiller’ keeping the water at a constant forty-nine degrees, an automatic feeder was attached to the tank ensuring a well-fed stock over twelve hour periods. He wasn’t just solely a teacher though. He was also a State Park Officer for thirty four summers, and an EMT for eleven. In addition to these duties and responsibilities Don and his wife Jackie managed to bring up three boys in their home in Boyne City. With hundreds of students over the thirty plus years there have been many interesting, momentous, and memorable outdoor teaching moments for him. Yet the ultimate culmination of a teacher’s career usually comes when they see one of their students years later. “I had a girl stop me in the hospital when my mother had been admitted and said that she had decided to go into nursing because of the day she saw me cut up a wild turkey…Go figure!” As Buz says, “there’s not a moment but when an older outdoor class student stops me and says that my class was his/her favorite and they learned a lot.” What a fitting tribute to an educator. What a fitting tribute to a sportsman. What a fitting tribute to a human being.